Gab & Evonna Joiner are native New Mexicans, they have proudly called Rio Rancho home since the mid 1970's after transplanting from their home of 20 years in the South Valley of Albuquerque. Family is the most important thing to Gab and Evonna, they are proud parents to Melvonna (Roy) and her husband Bobby, to Bill and his wife Evonne; grandparents to Chris (Joiner) and his wife Amy, to Shane (Roy) and his wife Erin, to Devonna Roy; and great-grandparents to Hannah and Charlotte. Gab brought home his first "goodie" in 1959, it was a 1926 Model T Ford coupe, he later traded it for a 1928 Chevrolet. He found his second "goodie" in Raton, New Mexico in 1959 as well, a 1918 Model T Ford that had been made into a pickup from a touring car. Gab's love for old cars has grown ever since. Evonna says "back in those days, all we could afford were basket cases he would bring home to restore." In 1963 he bought their first Model A Ford, a 1928 Special Coupe, in parts and pieces, from a friend of his in Trinidad, Colorado. He restored it with his son, Bill, and the family drove it on several tours; it is still a family treasure to this day and proudly sits on display in the museum's showroom. 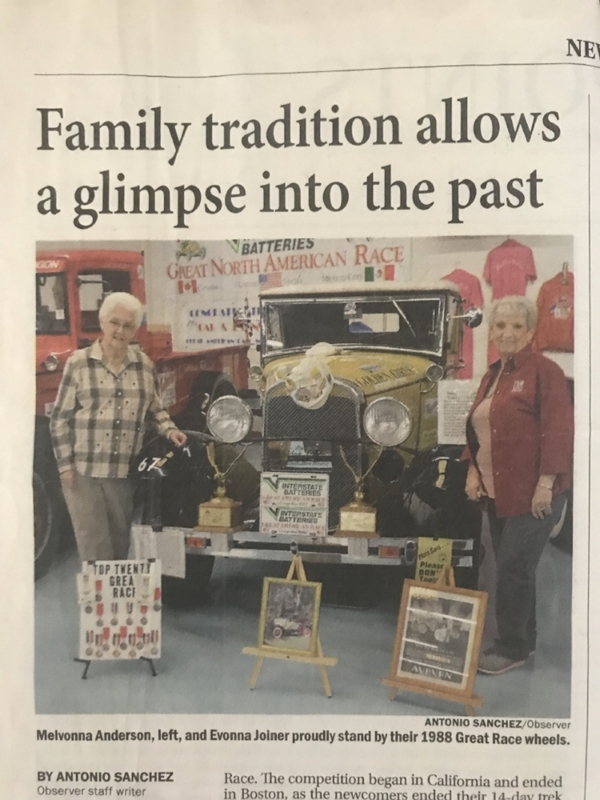 Since 1985 he has collected all makes and models of cars and trucks, most of which are restored to original condition; Gab's living collection, including his second "goodie," the 1918 Model T Ford, is on display in the museum. Gab and Evonna began their Great Race career in 1987 when Evonna and her best friend, Melba Anderson, wanted to race. Gab and Melba's husband, Tommy, thought it sounded silly, so Evonna and Melba decided if their husbands didn't want to participate in the race, by golly they would do it themselves. The two women brought a 1931 Ford Cabriolet and were dubbed the "Golden Girls." The race began in Disneyland that year, but due to a death in Evonna's family, they had to return home early. Gab always said Evonna was "bull-headed" so of course, in 1988 the ladies were back in, going from Disneyland to Boston. In the 1980's there were very few women in the Great Race, those who did participate were typically support crew or running with their husbands, but not Evonna and Melba, instead, they ran the show while being supported by their husbands Gab and Tommy. The "Golden Girls" made history that year, becoming the first all-female team to finish the race, this Great Race history making car can be seen on the museum's showroom floor. After going as Evonna's support, Gab decided to "start his engine" and join the Great Race. In 1989 the Great Race was a family affair for Gab and Evonna. Gab, their son Bill, along with their son-in-law Bobby drove a 1931 REO truck from Norfolk, Virginia to Disneyland. Evonna, their daughter Melvonna, and their four month old grandson Shane went as their support. By the end of the race, Gab and Evonna knew that they both wanted to participate in the competition and not just on the supporting end. Gab and Evonna ran the race together from 1990 until 2007. The Great Race went bankrupt in 2008 ending 25 years of Great Racing. The Joiners developed a reputation for bringing a variety of cars over their 19 years in the Great Race including: a 1931 Model A Ford Roadster pickup, a 1932 Packard Cabriolet, a 1932 Hupmobile, a 1917 Marmon, a 1934 Ford Roadster, a 1916 White, a 1922 Marmon, and a 1932 Ford the last year they ran. They won the Buick Sportsman's Class in the 1995 race from Ottawa, Canada to Mexico City, Mexico, while driving a 1917 Marmon, and were given a new Buick Riviera for their achievement. All of the race cars Gab and Evonna drove in the Great Races are on display in the museum's showroom. For years Gab kept his car collection in the basement of their family home, but after selling their home in 1995, the Joiners decided to create a family-friendly space to display their cars, have room for Gab to tinker on his cars with his kids and grandkids, and have a fun place for the family to gather and make memories. This vision started out as a small building with just enough space for Gab and his cars but has since grown into a museum with approximately 70 vehicles on display, along with other auto-related memorabilia. There are typically a few cars for sale or trade. There are also motor-related books, die-cast toys, and tin/porcelain signs in the bookstore. The museum has a range of cars for everyone's liking, from a 1912 Buick to a 1969 Mercury Cougar, which was daughter, Melvonna's first car. The museum holds so many great stories and memories from the Joiner-Roy family. Every single car has a special story to tell, including many laughs and a few breakdowns along the ways. Stop on by sometime and check out his treasure of a living collection honoring the legacy and life work of Gab Joiner. As many of you may know and as some of you who have recently begun following us may be looking to find out more about. Gab Joiner the beloved owner of the museum passed away back in May 2015 after a short battle with cancer. We as a family have grieved and miss him so much every single day. His legacy lives on not just in the museum which will be protected and will continue to operate without him, but also in his family who have become enamored with his passion for vintage autos. Nothing about the way the museum is run will change, We as his family love seeing the same level of excitement on our guests faces upon viewing his collection as what Gab had each and every day that he entered the museum. His passion runs deeply and we look forward to sharing it with everyone for many more years to come. With that said things such as the webiste have fallen behind times and our inventory of diecast has changed drastically. During the next month or so we will begin to add new merchandise and will continue to bring you your favorite diecast. Until that time we ask that any inquiries about diecast be sent either over email or by calling us. We would be happy to help you. The "Golden Girls" as pictured 30 years later.